Dimensions: 7.71" x 7.71" x 2.99"
✔ SAVE 87% IMMEDIATELY. Save 87% on your energy bill by replacing 120W with 15W LED. 50,000+ hours of life. 5-Year Unlimited Warranty. ● GIMBAL/EYEBALL DESIGN. Range of motion: 30° tilt and 359° rotation. 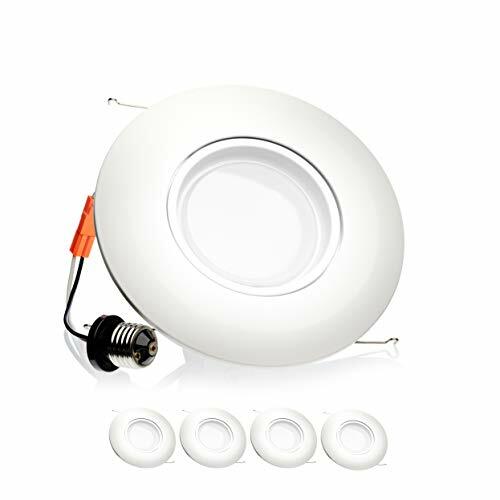 The rotatable 6" 15W Eyeball Downlight is perfect for sloped ceilings, and directional lighting as the LED can pivot and rotate for illumination where most wanted. ● EASY INSTALLATION: Ready to fit in 6" recessed Downlight housing cans directly. No additional accessories are required. ● DIMMABLE. Customizable brightness comes courtesy of its dimmable capability so you can set the preferred mood lighting. Compatible with most LED dimmers.